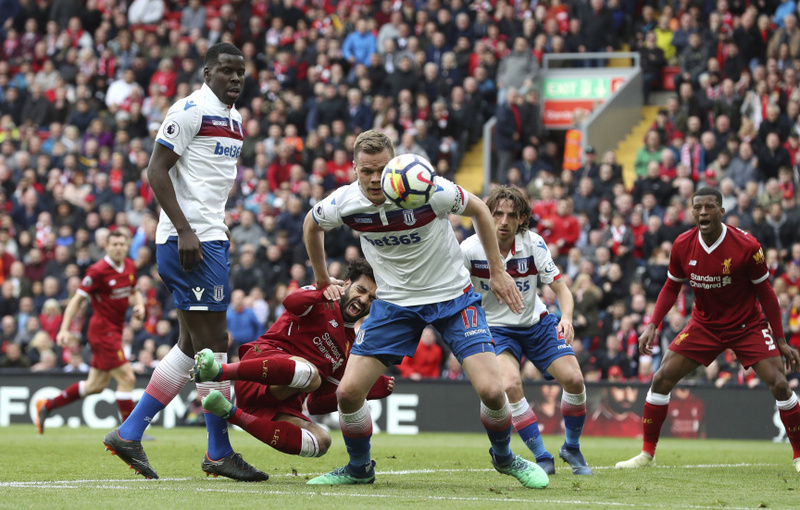 LIVERPOOL, England (AP) — Premier League leading scorer Mohamed Salah had a rare off day as Liverpool stumbled in its chase for a top four finish by drawing 0-0 with Stoke on Saturday. When the Egypt forward broke clear and dinked the ball over goalkeeper Jack Butland, most of Anfield started to celebrate. So there was a feeling of disbelief when the ball went wide and he was denied a 44th goal of the season in all competitions. It was the first time since Dec. 26 Salah had started a home match and did not score. It was Liverpool's third draw in four league games. Jurgen Klopp's third-place side still requires a maximum of four points from its last two matches, including a trip to fifth-place Chelsea, to be sure of Champions League qualification. Liverpool's priority is currently this season's Champions League and protecting a 5-2 lead over Roma heading into the semifinal second leg on Wednesday. The draw did little to help Stoke's survival bid as it remains in the relegation zone surrounded by teams with games in hand.